Could there possibly be a more iconic Manhattan wedding venue than the New York Public Library? For the truly discerning New York-based bride or groom, there could not be a more perfect location to have a wedding. When deciding where to get married, you have a lot of decisions to make. One of those decisions is whether or not your chosen wedding venue is in an easy to get to location. There is truly no place more centrally located in the New York Public Library! Located in Midtown on Fifth Avenue, the New York Public Library is close by to many large hotels. It is extraordinarily easy to find lodging for yourselves, your bridal party, your family, and your out-of-town guests. Whether you are looking for a luxury hotel or something a bit more budget minded, there will be dozens of options within walking distance of this location. When you're looking at the New York Public Library and trying to decide where to have your wedding ceremony and wedding reception, there are many rooms to consider. One of those rooms is the Celeste Bartos Forum. This enormous room can house up to five hundred standing guests, so it's perfect for a large wedding event! Astor Hall is famed for the extraordinary marble covering every single space in this huge Hall. For a sit-down wedding reception in Astor Hall, the venue can hold up to two hundred and fifty guests. Should you choose to have a cocktail hour in this space, you can have up to five hundred standing guests. The only catch to having part of your wedding day in Astor Hall is the timing - this part of the New York Public Library is only available for rent after the library itself has closed to the public. 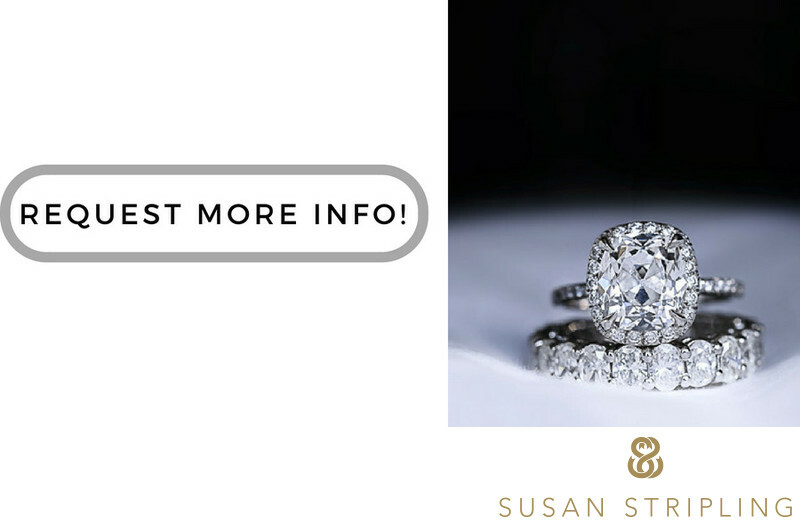 This will affect the timing of your day, so think long and hard about your timeline before booking Astor Hall for your wedding! Another space that is only available for rent when the public has left the library is the McGraw Rotunda. The Rotunda can house up to three hundred standing guests. If you'd like to have your wedding guests seated, you can have up to a hundred and fifty guests in this space. The ceilings in the McGraw Rotunda are enormous and quite beautiful. I also love the murals in the Rotunda, as they add a great sense of drama to this stately location. For a larger wedding at the New York Public Library, consider the Edna Barness Salomon Room. You can stand up to three hundred and twenty-five guests and seat three hundred in this expansive room. I absolutely adore how the ceiling in this four thousand square foot space mimics a skylight. I also love the paintings in the space. This is truly a great wedding location for an artist, or an art historian. Until researching the New York Public Library and their rules and regulations about weddings, I didn't know any of the fun and quirky perks that come with hosting your wedding at this venue. For one thing, you will become a listed contributor to the library when you choose to get married there. For another thing, you will have access to the library and their enormous, well-curated selection of books. I love that. As a huge reader, I cannot think of anything that would delight me more when choosing a wedding venue! When you book your wedding at the New York Public Library, your event fees contribute to help the collections, programs, and services associated with the library. I love this! When considering choosing a wedding venue, I always recommend to brides and grooms that they read reviews about the venues they are looking at. When looking for reviews on the New York Public Library, I encounter absolutely nothing but raves. Brides and grooms praised the extraordinary service by the staff at the New York Public Library. They talk about the amazing architecture, the beauty of the space, and how iconic the location is. They talk about what a wonderful experience their bridal party, family, and friends had at such a unique wedding venue. They talk about how much their out-of-town guests felt seamlessly incorporated into the New York landscape the second they walked through the venue doors. Wedding vendors also love working at the New York Public Library. I adore how warm and welcoming the staff at the Library is, not just to their wedding clients but the other wedding venues as well. It is wonderful to photograph the wedding when you truly feel like a collaborator with the other vendors. I am often asked about where to take wedding photos for a New York Public Library wedding. While the venue itself is undoubtedly beautiful, brides and grooms often want to go outside and have some of their wedding photos taken with Manhattan as their backdrop. 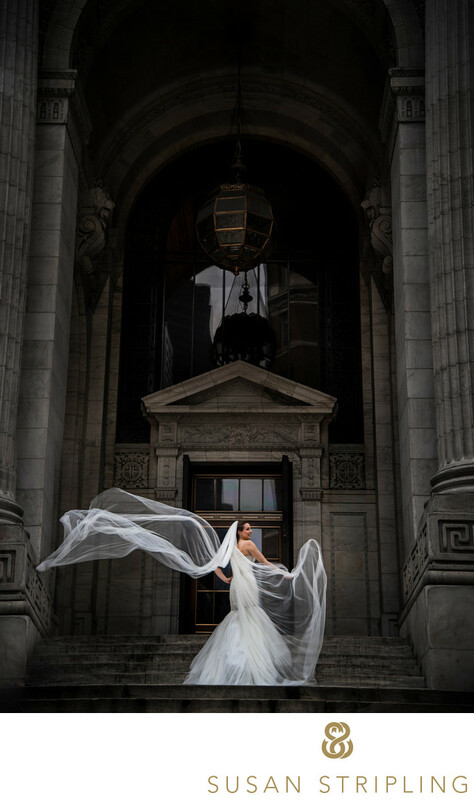 When it comes to wedding day portrait locations, you are in luck when you get married at the New York Public Library. Just outside the front door are the iconic steps leading up to the Library's entrance. The marble steps and soaring columns make an extraordinary backdrop for any wedding day photographs. I love drama. As an ex-theatre kid in high school and college, I was drawn to the fantastic three-act drama of a wedding day. You have the getting ready, the ceremony, and the reception. Each are very distinct but very important parts of the day. This particular 2014 wedding began at the St. Regis for the bride’s preparation. After a sweet first look in the St. Regis stairwell, we headed to the New York Public Library for some portraits of the bride, groom, bridal party, and families. After the portraits we went to Gotham Hall for the wedding ceremony and reception. This portrait of the bride was taken on the steps of the New York Public Library, in the beautiful breeze that follows a rain storm. The Manhattan skies opened and the rain came down as we were in our taxis traveling from the St. Regis to the Public Library. The bride and groom were absolute troupers and waited out the storm under the Public Library arches. This image was made within moments of the rain stopping. I love the dramatic arch of her veil in the wind and the look of absolute confidence and joy on her face. This remains one of my favorite portraits of a bride in 2014 but more importantly, it was a favorite of my clients! If your wedding is taking place at the NYPL, get in touch today! I'd love to talk to you about your wedding photography! Location: 5th Ave at 42nd St, New York, NY 10018. Keywords: Gotham Hall (45), manhattan (489), New York City (207), New York Public Library (6), St. Regis (21). 1/400; f/5.0; ISO 400; 65.0 mm.